Black Sunday has been used to describe 23 January 2005, when three fire fighters of the New York City Fire Department (FDNY) were killed in two fires: two at a tenement fire in the Morris Heights section of the Bronx, with four others being seriously injured and one at a house fire in the East New York section of Brooklyn. It was the deadliest day for the FDNY since the World Trade Centre attack on 11 September 2001 and particularly shocking since two different deadly fires occurred on the same day. The Bronx fire started on the third floor of a tenement on East 178th Street off the Grand Concourse and may have been caused by an extension cord to a portable heater setting fire to a mattress. Three alarms were called: Engine Company 42, Ladder Company 33, Ladder Company 27 and Rescue Company 3 were involved in fighting the fire. The alarm call was made at 7h59 on a cold, windy morning the day after a blizzard and snow hampered the engines in reaching the address; the closest hydrant was frozen and some hoses were either frozen or cracked. The apartments had been illegally subdivided using drywall partitions. 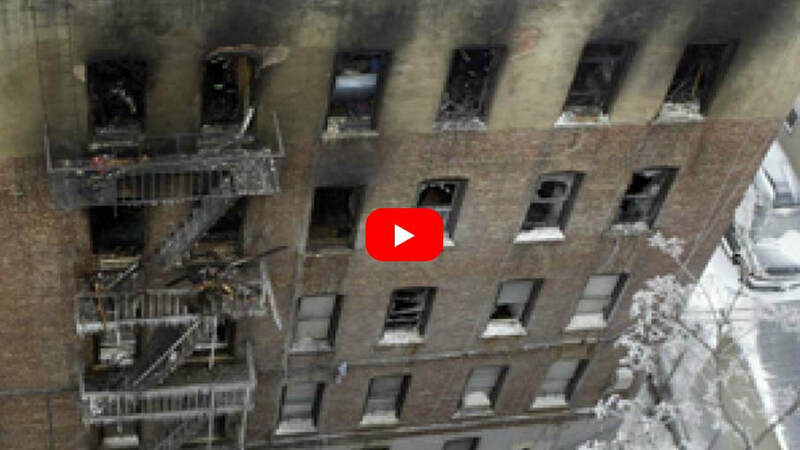 Six fire fighters on the fourth floor were trapped when the fire flashed through the door of the apartment, unable to find their way to the fire escape and decided to jump from windows. Only two had an escape rope, which one of them had bought for himself. Two were killed in the fall: John G Bellew and Lieutenant Curtis W Meyran, who was in command of Ladder 27. The other four, Brendan Cawley, Jeff Cool, Joe DiBernardo and Gene Stolowski, were severely injured and disabled and had to retire. DiBernardo died six years later; he had been promoted to lieutenant in May 2005 and Bellew received a posthumous promotion. The Brooklyn fire, later the same day, was in the basement of a two-family house on Jerome Street in East New York. People attending a birthday party reported smelling smoke; a group of fire fighters from Ladder Company 103 who were investigating withdrew from the basement when the heat became too intense but one, Richard T Sclafani, did not come out and was found unconscious on the stairs after apparently catching his equipment on a coat rack. He was pronounced dead at Brookdale Medical Centre, bringing the total number of fire fighter deaths that day to three, the highest number in one day since the 9-11 attack on the World Trade Centre and, unusually, in two separate fires. The FDNY issued personal safety ropes to fire fighters until 2000, when it discontinued the practice saying that they were too bulky and were not being used. The department's official report on the fire, issued in September 2005, stated that ropes would have been helpful and they were issued again starting a month later; since 2006 FDNY fire fighters have been equipped with a hook, a rope and a sliding mechanism. The report also blamed the fire fighters for poor communication and for remaining too long on the fourth floor given the conditions and those operating the pump for poor understanding of the equipment. The FDNY assigned a large part of the blame for the deaths to the building code violation for the subdivision of the apartment. The Bronx County District Attorney charged the landlord and two tenants in connection with the deaths. In criminal trials in 2009 the tenants, who had erected the partition, were found not guilty of criminally negligent homicide and reckless endangerment, while two former owners of the building were found guilty but the verdict was reversed a year later. The surviving fire fighters and the families of those who were killed announced their intention to file lawsuits against the city over the lack of safety ropes. The civil suit began in September 2015. Meyran's family reached a settlement; in February 2016 a New York State Supreme Court jury awarded damages of $183 million to the remaining five, of which approximately $140 million was to be paid by the city and the rest by one of the former owners. The families had reached a settlement with the former owner shortly before and, in September 2016, settled with the city for $29,5 million. Annually, friends, family and colleagues gather on a January Saturday morning for an 11am memorial mass and service at Brooklyn Engine 103 and Bronx Engine 46 Ladder 27 to pay homage to the trio. Richard Sclafani had a similarly well attended ceremony at the Brooklyn firehouse attended by Mayor Michael Bloomberg. 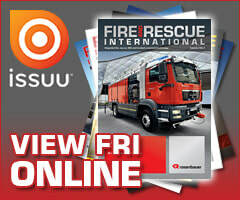 The Mayor said, “Every day, fire fighters risk their lives for people they’ve never met. January 23rd was no different. 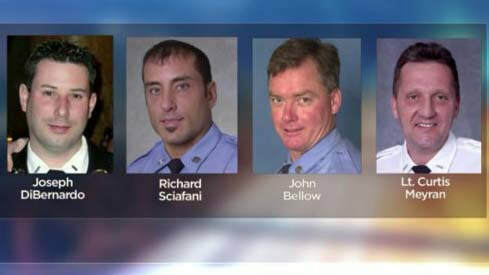 These men will always be remembered as heroes.” Mayor Bloomberg held fire fighter Sclafani's mother's hand whilst his sister spoke, “I have always felt the strength of my brother. We will always love him and we will never forget.